Terrific action shot with great interaction. The rest of the nest is an ugly but very useful box on the top of a post, erected for them along the river bank. Later on they will pile up more twigs and unfortunately plastic as well. Karl, superb incoming flight pose with nesting material, and I love how you captured its mate watching. Impressive detail and good light under the wings. I like the blood on the forehead... very nice details. Nice "nest under construction" shot . 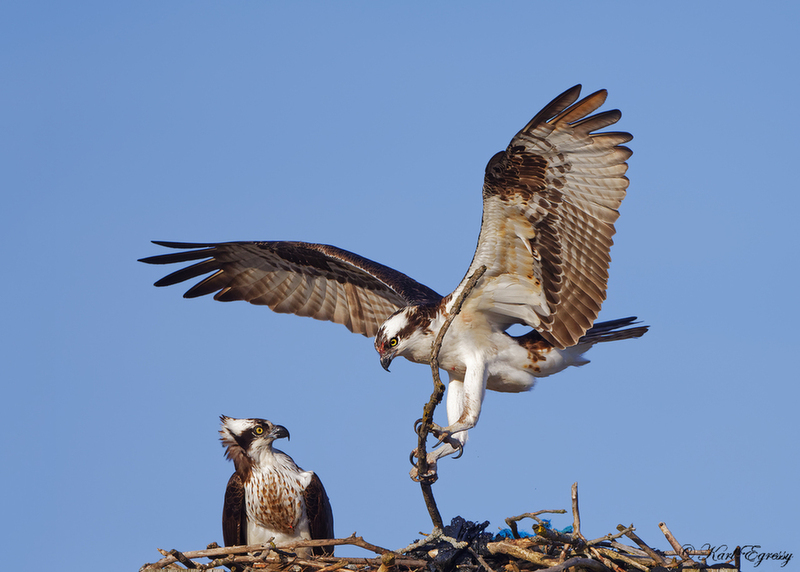 Ospreys build huge nests. I can't wait to see the nest when finished. nicely timed on the stick bring to the nest capture, good stuff KARL. Lovely interaction, Karl. The mate looks suitably impressed!